4Simplify your profile picture – The new profile picture (aka avatar) is now 180 pixels square. This means that you can no longer include a call to action (as some organizations did previously). Because this image will be as small as 30 pixels square, it’s best to use only your logo. You don’t need to include the name of your organization in your main avatar because the name of your Facebook page travels with your avatar everywhere on Facebook. 5Complete your About section – The About section has more prominence just below the cover image. This will include your address and contact information if you have a Facebook place, or just a brief description if you have a Facebook page (as shown below). 6Create milestones – Up until now, anything posted on the Facebook page was automatically tagged with the date it was posted. Milestones allow you to select any date in the past. The picture for Milestones can be up to 843 pixels by 403 pixels. 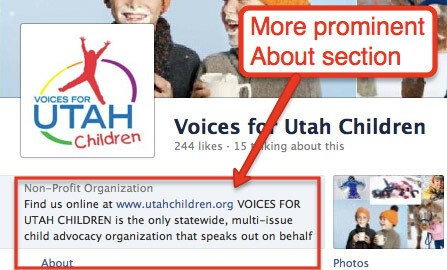 7Direct attention with highlights and pins – Up until now Facebook administrators had little control over how posts were displayed on their page. and visitors to that page would see updates in either reverse chronological order or in an order determined by Facebook’s EdgeRank. 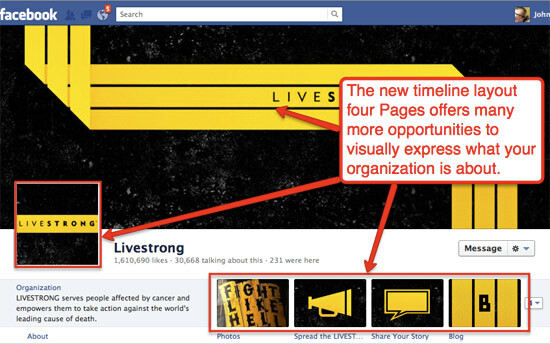 Pages now allow you to control feature specific posts on your page through highlighting or pinning. Highlighting turns any page story – which normally occupies a single column – into a full-width story (as shown below). This is perfect for large horizontal photos (dimensions for highlighted photos are 846 by 403 pixels). 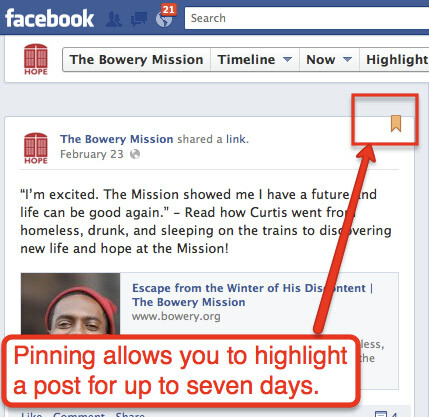 Pinning allows you to give any page story more attention by moving any page story to the top of your Facebook page. When you pin something on your page, it remains at the top of your Timeline for seven days, or until you unpin it, so it’s a good idea to think about what you want to feature at the top of your page each week (shown below). 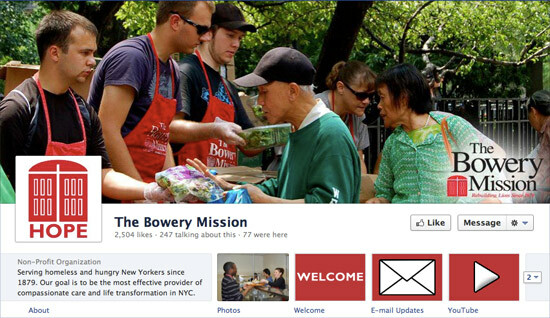 8Focus on photos – Again, Facebook Pages are now much more about your visual story told over time, rather than what’s happening now. As much as possible, it’s best to focus on telling that story through images and other visual content. Think Pinterest. 9No default tabs – You’ve probably heard by now that Facebook pages will no longer have the ability to set a default tab for nonfans. Default tabs in the past were primarily used as a way to increase fan conversion rates on a page. Now you’ll have to do that with your cover image, highlights and other ways to make that first impression. 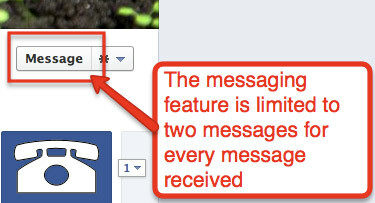 10No hard-sell messaging – Facebook pages also have a messaging feature that allows visitors to send you a private message. It may be really tempting to sell them on why they should donate or volunteer, but it’s better to use these opportunities to nurture a relationship on their terms. Keep in mind, they are messaging you – not the other way around. Also, you are limited to two messages for every one they receive. 11Not about you – At first glance you might assume that the story you’re supposed to tell is your organization’s story. But this may not be an interesting story, nor is it the real story. The story you must tell has to be bigger than you. It has to be about the cause. It has to be about your community. Post a link to your Facebook Page in the comments below so we can all see! Also, check out this video tutorial on everything you need to know about converting your Page over to the new Timeline. How are you using the new Timeline features? • Why Timeline is a colossal blunder for Facebook (Socialmedia.biz)John Haydon delivers social web strategy solutions for “the quick, the smart, and the slightly manic.” Curious? Then connect up: Contact John by email, see his profile page, visit the John Haydon blog, follow him on Twitter and Google Plus or leave a comment. This is a great list, thank you so much for sharing! Lots of great things to keep in mind. All really fantastic points. This is probably the best post on the Facebook Timeline I’ve seen so far. It’s a good summary on the ideology shift and the focus on visuals. Still trying to figure out our own strategy. Thanks! Thanks, Dan, yes, there’s a lot to figure out before Facebook throws the switch and converts all pages over to Timelines on March 30! The Believe In Tomorrow Children’s Foundation! http://www.facebook.com/BelieveinTmw?ref=tn_tnmn this was very helpful! I’m working on a blog post for our Duke University community to educate everyone on the new timeline features, and this was very helpful! Thanks. thanks for your Facebook Pages tips post. It is indeed informative and excellent.